© Posted on March 19, 2018, by Michael E. Newton. Is it true that James Hamilton was born in, “about,” or “around” 1718? Is it true that he was the fourth of eleven children? John Hamilton, baptized August 19, 1712. Robert Hamilton, born February 3, 1715, and baptized February 9, 1715. Alexander Hamilton, born February 6, 1717, and baptized February 12, 1717. William Hamilton (the one who had children), baptized October 7, 1721. Ramsing provided no dates of birth or baptisms for the other seven children. Douglas Hamilton, the fifth great grandson of Alexander Hamilton, located the baptismal records for the above William Hamilton along with his sister Elizabeth, who Ramsing had not mentioned. This then led me to the baptismal records of John, Robert, and Alexander. As H. U. Ramsing wrote, John Hamilton was baptized on August 19, 1712. Robert Hamilton was born on February 3, 1715, and baptized February 9, 1715, as Ramsing said. Alexander Hamilton Jr. was born February 6, 1717, and baptized February 12, 1717, as Ramsing wrote. Unlike the three baptismal records above, those of William and Elizabeth come from “a list of the baptisms” copied out of a “Mr. Thomas Brown’s manuscripts,” where they were “irregularly set down by him.” Although this list is not in order, it usually presents a number of entries in chronological order and then restarts from an earlier date and shows another series of entries. Using this “list,” H. U. Ramsing wrote that William Hamilton was baptized on October 7, 1721. While the baptismal record clearly has October, the day of the month is ambiguous and the year is missing most of the final digit. To me, the day of the month looks like 21, with the number 2 somewhat larger than the 1, as it likewise appears in the year, and the two digits touching each other (see the image below). But the exact day of the month, whether it is a 21 or something else, does not matter much. The year, however, is much more important. What is that last digit in the year? The three previous entries were from March–July 1722 and in chronological order while the three after were from January–November 1725 and also in chronological order. This would suggest the year of William Hamilton’s baptism is 1722, 1723, or 1724. Moreover, comparing the final, incomplete digit to other entries on the same page, the small portion of the last digit looks like the start of a 4 (see the additional images below) and looks nothing like any other number on the page. So it appears that William Hamilton was baptized on October 21, 1724. The day of the month that looks like a 21. Ramsing said it is a 7 but it clearly is not. It might look a little like a 4, but compare to the numbers 4 below. William Hamilton’s year of birth, with only a small part of the last digit visible. The last digit looks like it could be the number 4. Other examples of the number 4 on the same page. H. U. Ramsing did not write about the baptism of Elizabeth Hamilton, either because he did not see it on the same page as William Hamilton’s baptism or more likely because it was not relevant to what he was writing about, which was an effort to determine the year of birth of James Hamilton. Elizabeth Hamilton was baptized on August 7, but unfortunately only the first digit of the year is visible. The entries prior to this one start in 1725 and work their way to October 1732. Since this one is August and her father died in April 1732, this cannot be from August 1733. The entries afterward start at April 1728 and work their way forward. This suggests that Elizabeth Hamilton was baptized on August 7, 1727, but it is also possible that she was baptized in any year prior to 1727, though 1727 is more likely than 1726 or earlier. John Hamilton, baptized on August 19, 1712. Robert Hamilton, born on February 3, 1715, and baptized February 9, 1715. William Hamilton, baptized on October 21, 1724. Elizabeth Hamilton, baptized on August 7, 1727. What about the other children? What about James Hamilton, Alexander Hamilton’s father? “The genealogical tables” to which H. U. Ramsing and others used to determine the order of birth for the Hamilton children was first published in 1820 in George Robertson’s Topographical Description of Ayrshire. 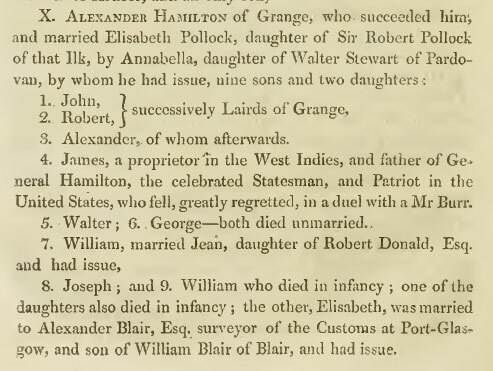 According to this genealogical table, which has been the basis for all subsequent Hamilton genealogies, James Hamilton was the fourth son and child of Alexander Hamilton of Grange and Elizabeth Pollock. Based on the baptismal dates for John, Robert, Alexander, and William and the order of birth given in the “genealogical tables,” one would indeed “presume” that James Hamilton was born in, “about,” or “around” 1718. But is this correct? Was James the fourth child? Was he born in, “about,” or “around” 1718? The nine sons are listed followed by the two daughters. It is unlikely that Alexander Hamilton and Elizabeth Pollock had nine sons in a row followed by two daughters. The William who “married Jean…and had issue” is listed seventh in the genealogy while a “William who died in infancy” is listed ninth. It is unlikely that the Hamiltons had a son William and then gave another child the same name when the first William was still living. More likely, the William listed ninth was born and died in infancy, after which the William listed seventh was born and given the same name as his deceased brother. Walter entered the University of Glasgow in 1737 while George did so in 1743. This six-year gap between them makes it unlikely that they were born one after the other. Based on these discrepancies, the order given in the family tree is probably incorrect. The William listed ninth should be before the William listed seventh. Walter and George likely were not born in sequence. Also, the two daughters probably were not born after the birth of all nine sons. Which William Hamilton was Baptized in 1724? The above records shows a William Hamilton being baptized on October 21, 1724, but it does not state which William Hamilton this was. H. U. Ramsing believed it to be the William who was listed seventh and had children, but the record does not state this. Ramsing presumably came to this conclusion because he thought the above “genealogical table” was in chronological order and therefore it must have been the William listed seventh rather than the one listed ninth. Knowing that the above “genealogical table” is not in order, it is no longer clear which of the two Williams was born in October 1724. More information is needed to determine which of the two was born in 1724. Four of the sons of Alexander Hamilton and Elizabeth Pollock attended the University of Glasgow. The dates of their matriculations (entrances) can help narrow down the years of their births. John Hamilton entered the University of Glasgow in November 1727. His date of birth is already known to be August 1712, making him 15 when he entered university. Robert Hamilton entered the University of Glasgow in November 1727 alongside his older brother. We already know that he was born on February 3, 1715, making him 12 when he entered the college. Walter Hamilton entered the University of Glasgow in November 1737, alongside the great Adam Smith (born June 1723). George Hamilton entered the University of Glasgow in November 1743. In 1745, he received the Snell Exhibition scholarship for postgraduate studies at Balliol College, Oxford, the same award Adam Smith won five years earlier, but there is no record of George studying at Oxford. Walter Hamilton, who entered university in November 1737, was probably born between 1722 and 1725. Since his brother William Hamilton apparently was born in October 1724, making a 1724 birth impossible (unless they were twins) and 1725 highly unlikely, Walter Hamilton was probably born in 1722 or 1723. George Hamilton, who entered university in November 1743, was probably born between 1728 and 1731. But Elizabeth Hamilton was born in August 1727, making a 1728 birth highly unlikely. Walter Hamilton, born circa 1722–1723. George Hamilton, born circa 1729–1731. In February 1737, James Hamilton entered into a four-year apprenticeship in which he served as an “apprentice and servant” to a Glasgow businessman. After the expiration of his term of service in February 1741, James Hamilton spent the next few months buying goods and then sailed to the British-controlled West Indian island of St. Kitts to become a merchant. Unfortunately, none of the records related to James Hamilton’s apprenticeship or career, nor any other known record of his life, gives his age or year of birth. But one can use the above dates to estimate James Hamilton’s year of birth. Given that James Hamilton entered into an apprenticeship in February 1737, one must conclude that he was at this time around the age to either enter college as some of his brothers did or enter into a business apprenticeship. Therefore, he must have been around 12 to 16 years old and thus born between 1721 and 1725. On the other end, James Hamilton became a merchant in the West Indies in 1741. He must have been at this time of legal age, i.e., at least 18 years old, and therefore must have been born in or before 1723. This seems to establish the date of James Hamilton’s birth at circa 1721–1723, not 1718. If James Hamilton had been born in, “about,” or “around” 1718, as previously assumed, he would have been 18 or 19 when his apprenticeship began. This is a relatively old age for one to begin an apprenticeship and begs the question of what he had been doing until this time. It seems more likely that he began his apprenticeship at the age of 14 to 16 rather than waiting until he was 18. James Hamilton, born circa 1721–1723. With the years of James and Walter partially overlapping, one would conclude that James was born circa 1721 and Walter circa 1723. This makes James Hamilton 15 or 16 when he entered into his apprenticeship in February 1737 and 19 or 20 when he became a merchant in the West Indies. Accordingly, Walter would have been 13 or 14 when he entered university. James Hamilton, born circa 1721. Walter Hamilton, born circa 1723. William Hamilton (first), baptized on October 21, 1724. William Hamilton (second), born circa 1726. This leaves us with just two remaining children: the unnamed daughter and Joseph. Unfortunately, I have found no hint as to when these two were born. However, we do know that Alexander Hamilton and Elizabeth Pollock married June 15, 1711, which means John born in August 1712 must be the firstborn child. Also, Alexander Hamilton Sr., the father of these children, passed away in April 1732. So that is about the time the last child could have been born. Looking at the gaps in the above timeline and assuming no twins, one child would have been born circa 1719 and another circa 1731 (changing George Hamilton’s year of birth from circa 1729–1731 to 1729 because it is more likely he entered college at age 14 than 12). Joseph or unnamed daughter Hamilton, born circa 1719. George Hamilton, born circa 1729. Joseph or unnamed daughter Hamilton, born circa 1731. I must admit that this suggested order of birth and the years of birth depend to a large extent on assumptions and conjectures, albeit reasonable ones based as much as possible on the available evidence. 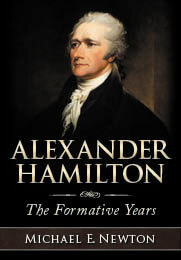 Nevertheless, the above order of birth is more likely to be correct than that given in the “genealogical tables” and the year of birth assigned to James Hamilton, Alexander Hamilton’s father, is more likely to be “circa 1721” than “about” or “around” 1718 for the reasons given above. It would thus appear that the general consensus that James Hamilton was born “about” or “around” 1718 and was the fourth child of Alexander Hamilton and Elizabeth Pollock is mistaken. Rather, it appears that he may have been born in or about 1721 and perhaps was the fifth child of Alexander Hamilton and Elizabeth Pollock. Whether one agrees with this new conclusion or continues to believe the old narrative, it is important to emphasize the uncertainty regarding both the order and years of birth for the eleven Hamilton children given the lack of definitive evidence. Michael E. Newton, Alexander Hamilton: The Formative Years 16. George Hamilton, A History of the House of Hamilton 221. The Matriculation Albums of the University of Glasgow from 1728–1858 18 and 30. Munimenta Alme Universitatis Glasguensis 3:235. The Matriculation Albums of the University of Glasgow from 1728–1858 18. The Matriculation Albums of the University of Glasgow from 1728–1858 18, 30; Addison, The Snell Exhibitions 45–46. Michael E. Newton, “The Early Business Career of Alexander Hamilton’s Father,” Discovering Hamilton. Presumably this daughter had a name, unless she died during birth. “Unnamed” simply means that no name was provided in the genealogical table.